Ask RP Photonics for advice on optical cavities, including dispersion effects, the use for laser stabilization, etc. 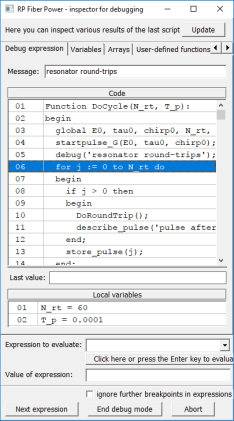 where the approximation holds for low round-trip losses (e.g., <10%), i.e., only for high finesse values. 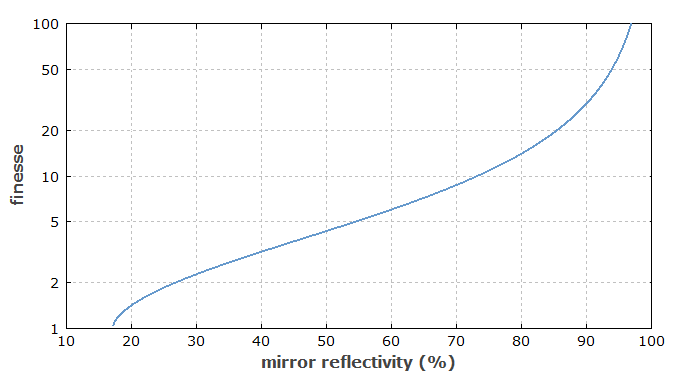 Figure 1: Finesse of a symmetric resonator as a function of the mirror reflectivity. The finesse is related to the Q factor: the latter is the finesse times the resonance frequency divided by the free spectral range. 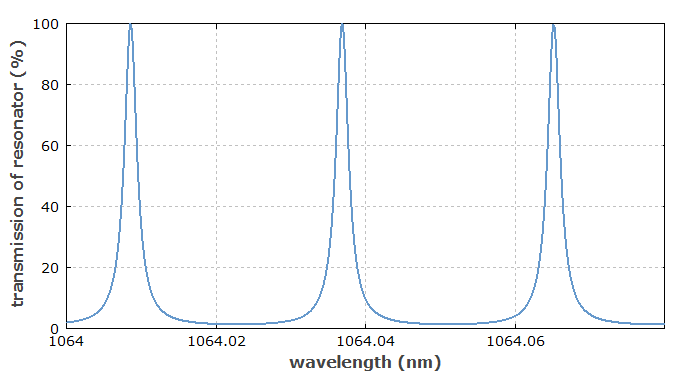 Figure 2: Frequency-dependent transmission of a linear Fabry–Pérot interferometer with mirror reflectivities of 80%. The finesse is ≈ 14, and perfect mode matching is assumed. Figure 3: Same as in Figure 2, but with higher mirror reflectivities of 90%. The finesse is ≈ 29.8. Note that the apparent bandwidth of the resonances, observed e.g. by scanning the resonator length while observing the transmission with a single-frequency input wave, can appear to be increased due to the excitation of transverse modes with different orders. For a perfectly aligned confocal resonator, the frequencies of even higher-order modes are degenerate with frequencies of axial modes, so that this effect does not occur, but with some misalignment the modes are no longer perfectly degenerate. The apparent finesse can then be reduced. 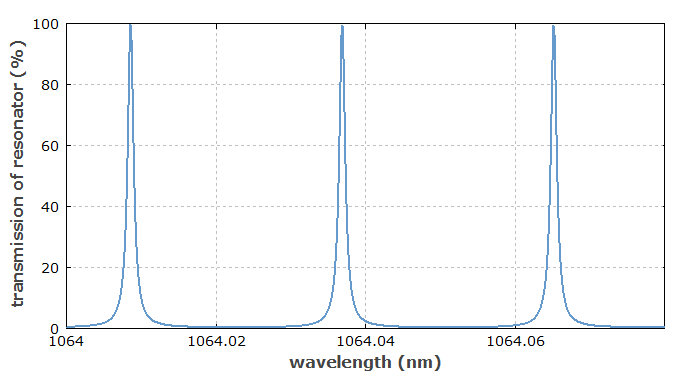 A high finesse can be useful for optical spectrum analysis (→ spectrometers), because it allows the combination of a large free spectral range with a small resonator bandwidth. Therefore, a high spectral resolution in a wide spectral range is possible. A very high finesse (above 106) can be achieved either by using dielectric supermirrors or in certain microcavities based on whispering gallery modes.